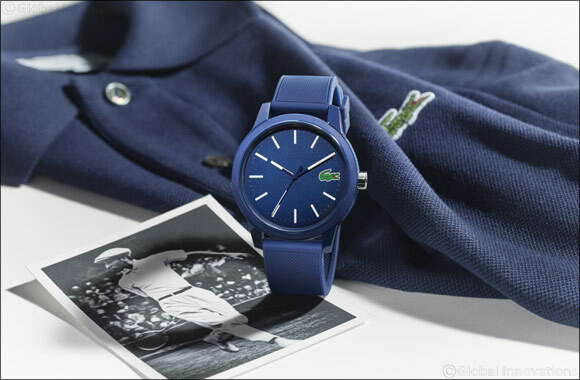 LACOSTE revisits its classics and offers a new version of its iconic LACOSTE.12.12 watch. February 18, 2019 United Arab Emirates: The collection is available in a three-hands or chronograph version. True to the brand's DNA and inspired by the iconic polo shirt, these two new models show time elegantly by opting for sporty lines and timeless colors such as blue, red, green, black or white. The strap, decorated with an embossed petit piqu� pattern, matches the silicone bezel. White indexes and hands set a contrast from the dial. The LACOSTE.12.12 collection, recognizable by its green crocodile positioned at 3 o'clock, is also distinguished by two discrete new markings: a stylized polo shirt on a petit piqu� background on the back of the case and a LACOSTE.12.12 marking on the end of the strap. This Lacoste timepiece is priced at AED 415 and is available across Hour Choice stores in the UAE.